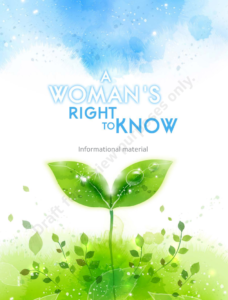 Draft of ‘A Woman’s Right to Know’ (2016). Inaccurate statements have been highlighted in yellow. Statements often accelerated embryological or fetal development by representing systems as developing at earlier stages of life. Examples: Week 4: Bone tissue is growing or Week 6: Brain activity can be recorded. Inaccurate statements stated that certain body systems were completely formed when they were in ‘primordial’ stages of development. 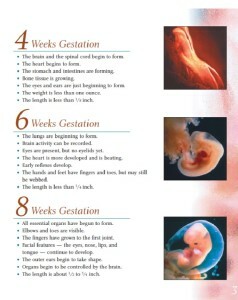 Examples: Week 4–The brain and spinal cord begin to form; Week 4–The heart begins to form. 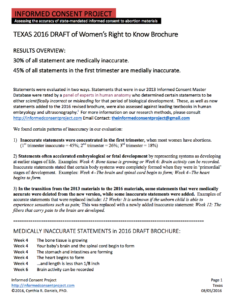 In the transition from the 2013 materials to the 2016 materials, some statements that were medically accurate were deleted from the new version, while some inaccurate statements were added. 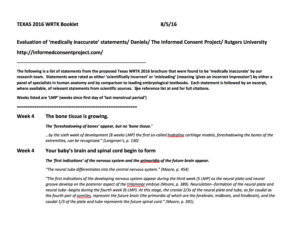 Examples of accurate statements that were replaced include: 12 Weeks: It is unknown if the unborn child is able to experience sensations such as pain; This was replaced with a newly added inaccurate statement: Week 12: The fibers that carry pain to the brain are developed.